Game 31: Bruins 8, TOR 5: David Krejci gets his first NHL Hat Trick, Wideman cracks glass, Toskala is pulled and then replaced. Each Toronto goalie gives up 4 goals. Kessel Streak: 16 games. Game 33: Bruins 6 STL 3: It's a battle of the Mannys, but Wheeler steals the show in the first 5 minutes, scoring a short-handed goal for a possible goal of the year. In the first period, 2 penalties each have a SHG and a PPG. Martin St. Pierre gets an assist in his first game with the Bs. Kessel Streak: 18 games. Game 34: Bruins 2 NJD 0: Kessel's streak ends but Thomas makes a BEAUTIFUL save on Elias to get a shutout and Lucic scores in his 8th game. Krejci pots the empty netter. This is the first time the Bruins have won more than 5 in a row all season. Game 35: Bruins 3 CAR 2: Blake Wheeler scored 2 goals in less than 5 minuts for the millionth time. A Savard pass leads to the game-winner. Game 36: Bruins 2 ATL 1: The Bruins finish a season sweep of the Thrashers. This time it's krejci passing to Ryder that causes the game-winner. Game 37: Bruins 5 PIT 2: The highlight of this game is a 4-on-3 Bruins powerplay with Savard and Krecji up front. They get into the offensive zone, and prove the Greater Crisp Passing Theory of hockey. Game 38: Bruins 4 PIT 2: 10 in a row. The Bruins continue to beat the slumping pens, scoring an empty netter to finish this one off. Vladimir Sobotka stands up Jordan Staal at the blue line. Game 39: Bruins 2 BUF 4: The winning streak ends. The Buffalo defense was fantastic, the Bruins couldn't get anything going, except a Shawn Thornton goal. Game 40: Bruins 0 MIN 1: Minnesota grinds out a 1-0 win on the strength of a Marek Zidlicky power play slap shot. The Wild are undefeated in Boston over 5 games here. Dammit. 3) You travel to many Wild away games, and have home season tickets. Is that awesome or totally awesome? WRT: With the number of Wild games I see in person (50 this season alone) I have somewhat of a feeling of how players and the rest of the teams' travelling party feels like. For them, it's a real grind. Thank God, they get to fly charter. The rest of us are stuck with commercial flights, a lot of which are late and/or cancelled. Say what you will, but the NHL really needs to rethink how it schedules games. To ask anyone to play hockey in Southern California (or Florida) one night and in sub-zero Minnesota (or, Ottawa) 48 hours later is asking a lot. It's good and it's bad for me (and my wife) as our schedule is set so far in advance we normally get cheap air fares (cheaper after Southwest begins serving Minneapolis-St. Paul, March 6) but then we have very little flexibility to change our minds after we commit to a game. I know the B's don't have that much of a problem with it, but out here we are really screwed. Game 40: Greg Nation, friend of the Blog. Which Boston-area mascot is the best? I hate mascots. In fact, everyone above the age of 5 does. They're stupid, cartoonish creations that detract from the seriousness of the sport. 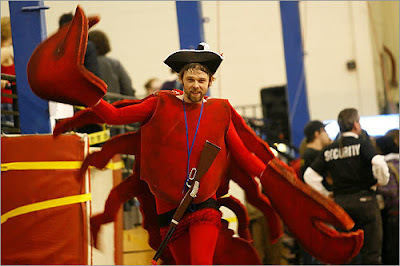 But, if I had to pick a favorite, it would be the Boston Massacre Roller Derby's mascot, which appears to be a drunk guy in a lobster suit with a rifle. Tim Thomas, second period of Game 34 in New Jersey. Elias has a wide open net and Thomas is sprawled out from a save on Parise. SAVE. So huge. Vladimir Sobotka on Jordan Staal. Sobotka is tiny, Staal is huge. Very nice write-up. I like the best-of style of this one.